The Douro is 897 kilometres long. It rises in northwest Spain and discharges into the north Atlantic Ocean in North Portugal at Porto. The months of June to September are particularly recommended for a Douro River Cruise. Portugal's second-largest city, Porto, is on the itinerary of the Douro River Cruise. The quaint old town, Ribeira, which was declared a World Cultural Heritage site by UNESCO in 1996, is particularly worth seeing, as is the Maria Pia Bridge, which was designed by Gustave Eiffel. Continuing on to Spain, to Vega de Terron you will become familiar with the impressive landscape of the Douro Valley, which brings together extensive vineyards, idyllic olive groves and lush natural scenery. In the long-famous Spanish university city of Salamanca you will be able to admire the former bullfighting arena, Plaza Mayor, and the house of mussels, "La casa de las conchas". 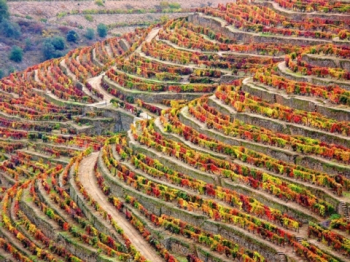 The Douro River Cruise then continues to Ferradosa — a centre of Portuguese wine. Lush sloping vineyards and picturesque Portuguese towns, such as Sao Salvador do Mundo or Sao Joao de Pesqueira will leave an impression on you. Experience the fascination of Portugal and Spain on a Douro River Cruise. Whether you are a lover of nature, culture or wine, this journey has something for everyone: Landscapes which alternate between lush greenery, bizarre rocky landscapes and vineyards lend this journey its quite particular character.